I have my large BAY Chloe bag in white patent, but it is not exactly white (more ivory) and, while it is perfect for business outfits, it is way to stuffy for casual walks. 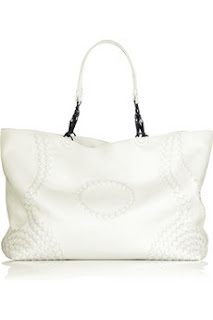 My favorite is the white soft leather large tote with a circular intrecciato pattern from Bottega Veneta, but at 1.350 € (even though discounted from 1800) is way over my budget. Other bag that caught my eye was the Paddington white Tote Bag, with the cutest plexi details, but yet again the price tag was just a little too much. Another possibilities were the Alex leather bag from Jimmy Choo (hardware too goldish) or the ruched self-tie shoulder bag from Michael Kors (too long handles). 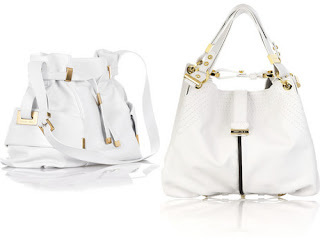 Finally, I decided on a Choo bag as well, a Dessy medium holdall, with gold eyelet detail around the top, that has the perfect shape (and price - 500 euro, discounted from ~900) for what I had in mind. 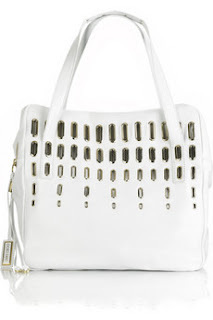 I have it for now in my shopping bag on net-a-porter.com, and I am still deliberating if to buy it or not. The Paddington is my favorite but in addition to being expensive, I'm told they're quite heavy. I don't know if that's true, I've never picked one up to see! I didn't weight a Paddington either, but i have a large BAY, and although the big size it is quite light... Anyhow, i decided for the Jimmy Choo one :) Monday probably i will receive it, so more on it after that!